Occupational Health and Safety (OHS) controls have become as important as security controls when it comes to the control of access to a facility or restricted environments. Many clients today need to check and manage statutory accreditations and competency prerequisites prior to allowing personnel and visitors onto their premises or work areas. Some of these requirements include legislative, HR, health and safety, and accreditation or competency (training and induction) prerequisites. This data is generally managed by the HR department and the security or access control systems merely block or unblock the user’s access manually from time to time when notified that the user’s ‘certification’ is valid or has expired. Veracitech develops and deploys plug-ins on the Babylon platform for various active client applications; one such application is the Veracitech Babylon Certifications solution. The plug-in comprises access control and automation, incorporating the certifications prerequisites listed above. These certifications can be defined and managed either directly in the Veracitech Babylon Certifications application or can be integrated with existing HR or other databases. • Access can be determined by the security level/profile as well as if the user has a valid medical check-up or has been certified in a certain skill required for access to a specific area. • Before allowing anyone to start a truck or machinery on a plant, the system may first check to ensure the individual’s licence is up to date and that they underwent a breathalyser test that morning before granting access to the truck or machinery. 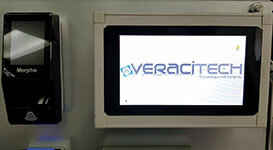 Feedback to the user and an explanation for Access Denied can also be displayed on the Veracitech interactive touch display modules at the access points. These are fully integrated and managed from the Veracitech Babylon Certifications application. Many industrial clients use smart key and locker management systems, such the TRAKA system from ASSA ABLOY to manage who has access to certain keys. Again, here the client traditionally has to control the key management as a separate, standalone system from their access control, security or HR/OHS systems. With intelligent key systems, keys are available 24/7 to authorised staff only, and usage can be managed. Veracitech has partnered with Traka and is the only authorised system integration partner on the Babylon platform for Traka systems. 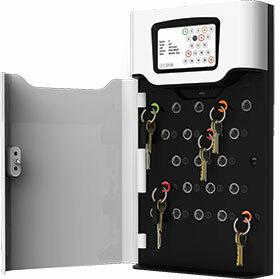 Veracitech again developed a plug-in for the Babylon platform, the Veracitech Babylon Key & Locker Management solution. In this solution, high-level database integration with the Traka backend allows key and locker users to be managed seamlessly in the Babylon user database. Access level definitions ensure that full control and management of key and locker rights is centrally administered from the Babylon environment only. Through this high-level Babylon/Traka integration, the client can now incorporate access controls with key/locker controls, and even combine this with the certifications solution mentioned above. • Access can be allowed / denied based on keys returned: e.g., users can be prevented from leaving the site without returning keys. • Access rights to keys can be based on not just the key profile, but also the validity of the user’s certifications (users can only withdraw a vehicle or machine key if they have the prerequisite certification status, such as a valid driver’s or operator’s licence on record, or have passed the breathalyser test within the last hour, etc.). • With the access automation features of XMP-Babylon, one can also control key or locker rights not just by access profile and certification prerequisites, but also by live status processing in the system. For example, a user can only withdraw a key if his manager is badged in and present at the time, or a user can only withdraw a key based on previously areas accessed (or not accessed) within a pre-set period. • Key and locker alarms and events will also be reported and managed in the XMP-Babylon Alarm and Even Handling, alerting the administrator when keys are not returned on time etc. 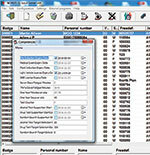 There are numerous other applications and integrations Veracitech has developed on the Babylon. All told, Veracitech offers the design, installation, configuration and custom development and integration of multiple security and operational systems into the Babylon platform, which will allow clients to more efficiently manage their operations, even distributed operations, reliably from a central source. Veracitech is a bespoke system engineering house and direct authorised OEM partner for Autec XMP-Babylon systems. The company currently has a client list that includes companies like Anglo Platinum, De Beers, Petra Diamonds, Namdeb, Debmarine, Gemfields, South32, DTI, Transnet and others, including clients in Namibia, Botswana and Mozambique.